Snow Hill Mennonite Church, Snow Hill, Maryland. 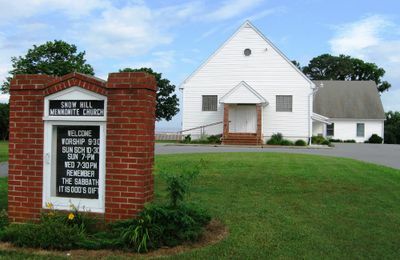 Snow Hill Mennonite Church (Biblical Mennonite Alliance), located 3 miles north of Snow Hill, Maryland, was originally a member of the Ohio and Eastern Mennonite Conference. It was established in 1953. It had 31 members in 1957 and Omar Stoltzfus was its pastor. In February 1999 the congregation became a charter member of the Biblical Mennonite Alliance. At that time it was unaffiliated with any conference. In 2015 the leading minister was Nathan Hostetler. The congregational membership was 43 and the average weekly attendance was 50. Gingerich, Melvin and Richard D. Thiessen. "Snow Hill Mennonite Church (Snow Hill, Maryland, USA)." Global Anabaptist Mennonite Encyclopedia Online. August 2016. Web. 22 Apr 2019. http://gameo.org/index.php?title=Snow_Hill_Mennonite_Church_(Snow_Hill,_Maryland,_USA)&oldid=140797. Gingerich, Melvin and Richard D. Thiessen. (August 2016). Snow Hill Mennonite Church (Snow Hill, Maryland, USA). Global Anabaptist Mennonite Encyclopedia Online. Retrieved 22 April 2019, from http://gameo.org/index.php?title=Snow_Hill_Mennonite_Church_(Snow_Hill,_Maryland,_USA)&oldid=140797. Adapted by permission of Herald Press, Harrisonburg, Virginia, from Mennonite Encyclopedia, Vol. 4, p. 556. All rights reserved.